I have reason to believe that my husband of almost 34 years still loves me, despite my having given him many reasons to think twice about it (and likely more often than twice). I believe this most firmly during the time that Winter begins to yield to the earliest signs of Spring, when the crocuses begin to peek their tightly furled spears out of the snow, victoriously hatching open amid the dark brown layer of last autumn’s mulch of dead grass and leaves. See, unbeknownst to me during one autumn mulching season, my darling hubby got a lovely and romantic idea. He went out and bought a bag of crocus bulbs and planted them along the front of our house, in the area of garden between the sidewalk and the curb where I park my car. He kept this secret, as I yawned my way out the door every morning on my way to work, sighing about how the short grey days of January seemed to stretch dully on my horizon for too long. He never told me about his surprise, just offering quiet words of encouragement that one day soon, there’d be a glimmer of Spring to remind me that better days lay ahead. And just when I felt doomed to endless leaving and returning in the dark, my days bookended by gloomy hours while the brighter daylight hours were lost to me, stealing past me while I worked indoors, suddenly… Bunches of yellow, purple and white greeted my feet as I crossed the lawn. Gorgeous heralds of Spring were spreading their cheerful petals along my path, nodding to me and reminding me that soon we would be in lighter clothes, soon there would be daylight hours to see me on my way every morning and usher me back home in the evenings. Soon we’d be celebrating Easter and Mother’s Day, and then we’d be preparing for days at the beach and hiking with friends. And best of all, reminding me that after all the muddy water that has passed under the bridge of our marriage, all the ordinary wear and tear of living side-by-side, raising children, struggling to pay the bills, moving into new homes, changing career paths, our love has not eroded away. He still loves me and cares for me, and I for him. He still builds the mystery, with acts of tender loving kindness. He still spends time thinking of ways to nurture our love through the dark of every Winter to the dawning of another beautiful Spring. 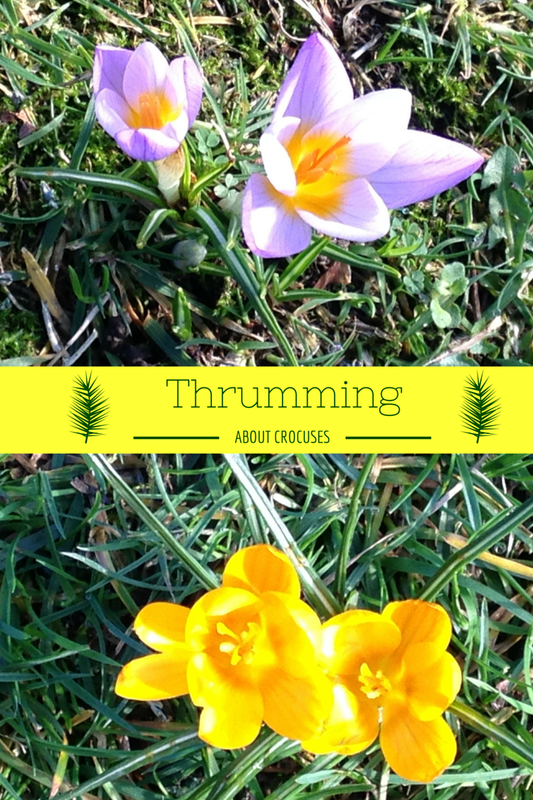 That’s the thrumming of the crocus to me, making my heart flutter anew every Spring, reawakening me to the truly meaningful things that make life beautiful.